It's back! The Good Food & Wine Show is set to start its Australia-wide, and the show has a new face to represent! High-profile British culinary sensation Ainsley Harriott has been appointed the face of this year's popular Good Food & Wine Show. A best-selling author and television personality, Harriott has written 12 food books with global sales of more than two million, so he's the perfect fit for Australia's largest foodie event. Harriott will be present at the 4-day Melbourne event in June - on from 5-8 June where he'll join favourites Miguel Maestre and Alastair McLeod - both back for another year to set foodies on the right path to experiencing 2015's flavours, fragrances and fresh finds. Event Director of the shows, Louise Osborne, says it is great to have such a high-profile chef and personality as part of the show. "Ainsley is immensely popular and we look forward to him coming to Australia to not only help us promote the shows via his debut at the Melbourne event but also to do some demonstrations in new and novel ways." Ms Osborne said this year's Good Food & Wine Show program has been designed to get people thinking about how and why they use certain ingredients, not just the things they stock their pantry with. "Showcasing the diversity of the food and wine culture in Australia - from family-run businesses to established artisan companies, our best local and interstate chefs and restaurateurs, and mouth-watering national and international street food, there's no doubt that anyone coming through the doors this year will be set for some fun. "What's more, we are excited to announce that this year's program will not only be about giving visitors onsite experiences as we'll be taking elements of the program to the streets of each state to ensure no one misses out!" Also joining the Good Food & Wine Show for another year as the show's primary sponsor is Citi. Citi Australia’s Managing Director, Customer Franchise, Linda Duncombe, said the bank is delighted to continue its partnership with the Good Food & Wine Show, as part of Citi’s commitment to the local food and wine industry. "The Good Food & Wine Show continues to inspire Australians to celebrate good cuisine and this partnership is an important part of Citi’s support of the food and wine sector in Australia. Our partnership with food and wine events around Australia aligns with our popular Citibank Dining Program, which encourages our customers to dine out at hundreds of restaurants around the country." With a particular focus on on-trend foods and beverages, and never-before-seen food experiences, this year’s shows will also feature a host of crowd favourites along with a number of new master classes*. *Ticket sales for master classes available from early April 2015. Good Food & Wine Show is Australia’s largest consumer food and beverage show. Each year over 110,000 visitors head to the shows in Melbourne, Perth, Sydney and Brisbane to experience a day out where they can take home a new discovery to inspire their next foodie adventure. Good Food & Wine Show is a forum for Australian exhibitors to join local producers and showcase their wares to industry leaders and highly engaged audiences. Some of Australia's best and most unique brands repeatedly align themselves with the Good Food & Wine Shows and join a host of well-known celebrity chefs, unique features and master classes which excite and inspire those who visit the shows. And Josie's Juice fave 'The Wog With The Grog' will also be attending the show. Go hunt him down for the best grappa (Nardini) and the best limoncello (Sovrano) and the best Italian wines and sparkling wines (Majolini). UPDATED: you can now win tix to the Sydney show. TWO DOUBLE PASSES up for grabs! Winners will have their tickets mailed, so comps for each state will close several days prior to the event. · Adam Liaw - Instantly recognisable with his warm smile and topknot, Adam is a much-loved cook, TV presenter on SBS, writer and winner of MasterChef Australia’s hugely popular second season. 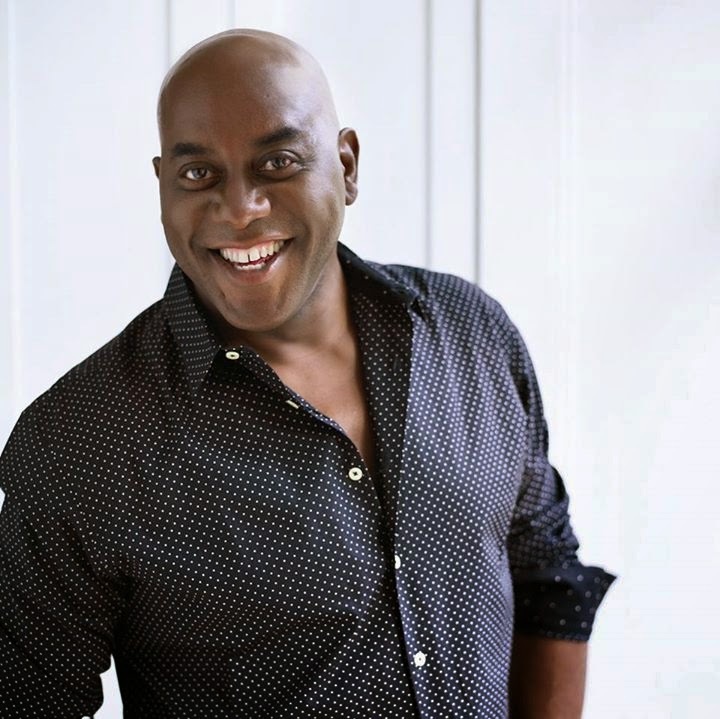 · Ainsley Harriott - After 20 years as one of the UK’s favourite TV chefs, Harriott is something of an institution. An internationally best-selling author, host of the long-running Read Steady Cook and numerous other TV specials, he is the master of fresh, fun, accessible cuisine. · Frank Camorra - A Melbourne favourite, Barcelona-born Camorra is chef and co-owner of MoVida Sydney and Melbourne's MoVida Bar De Tapas. He is also the award-winning author of four highly-regarded cookbooks. · Hayden McFarland- Committed to balancing the beautiful traditions of fine-dining with a modern sense of adventure, McFarland and his co-sous chef Thomas Woods took over the iconic restaurant Woodland House after working with culinary legend Jacques Reymond. Working with classic flavour profiles and techniques, he is known for his elegant style and commitment to customer experience. · Joe Grbac - Raised in Melbourne with 11 brothers and sisters, food has played an integral part in Grbac’s life. Heading to London 2002, he cooked at Michelin star restaurants such as Gordon Ramsey’s Hospital Road and came under the tutelage of Philip Howard at The Square. Grbac owns and operates his own restaurant in partnership with Scott Pickett – Saint Crispin. · Miguel Maestre - Popular Spanish food host of The Living Room, Miguels Feast, Miguels Tropical Kitchens and Boys weekend at Channel 10 and the LifeStyle Food Channel. · Sarah Wilson - Sarah is a New York Times best-selling author and blogger whose journalism career has spanned 20 years. Wilson is the former host of the first series of MasterChef Australia and author of the best-selling series of cookbooks from I Quit Sugar.com. · Sammy & Bella - 2011 MKR winners, passionate home cooking experts for the LifeStyle Food Channel, resident foodies on Channel 7’s The Morning Show and owners of Sammy’s Burger Bar and Bella’s Feast. · Silvia Colloca - Italian born food lover, Silvia Colloca, has made a name for herself cooking delicious recipes that have been passed down her family for generations. Cooking traditional, authentic and mostly simple recipes, Silvia is a popular blogger, author of Silvia's Cucina and has starred in a television series Made in Italy with Silvia Colloca on SBS. · Anna Gare - Anna Gare is one of Australia’s most popular cooks and television hosts of popular cooking shows including the ABC’s Consuming Passions, The Best in Australia and Quickies in My Kitchen. Anna is also well known globally for her role as presenter and judge on Junior MasterChef and most recently The Great Australian Bake‐Off. · Paul West - Popular chef-turned-farmer at River Cottage Australia television series on the LifeStyle Food Channel. Instantly recognisable with his warm smile and topknot, the SBS ‘Destination Flavour’ host and ‘MasterChef’ Series 2 winner is one of Australia’s favourite new cooks and commentators. His talent for creating Asian-inspired dishes with clean, fresh flavours also translates to print, where he is the author of three well-loved cook books. Articulate and witty, Adam always brings his own unique perspective to everything he does, including his popular food and culture column for The Wall Street Journal’s Scene Asia. A much-loved chef and TV personality, Alastair was born in Ireland, classically trained in Europe, and has chosen to make Brisbane his home. His experience in the kitchen is extensive; he’s worked at Michelin-listed, high-profile and fine dining restaurants across the world. Alastair regularly writes for Brisbane News, presents on Channel Seven’s Queensland Weekender and Network TEN’s Ready Steady Cook, and he is frequently heard on ABC Radio. He recently launched Al’FreshCo, a catering company. Alistair is an ardent supporter of all things local, believing the closer you are to the source of your food the better it will taste and the smaller the carbon footprint you will create. As Executive Chef of four Merivale restaurants (Mr. Wong, Ms G’s, Papi Chulo, El Loco), Dan Hong has captured the attention of Sydney’s foodies and cemented his reputation as one of Sydney’s fastest rising culinary talents. Dan started his career in the kitchen of his family’s Vietnamese restaurant chain and quickly developed a taste for a career in challenging and exciting kitchens. His restaurants are highly regarded and have won many accolades and awards, and in 2014 Dan was a finalist for ‘Chef of the Year’ in the 2014 Sydney Morning Herald Good Food Guide Awards. Instantly recognisable as chef and TV personality and as one of the judges on MasterChef, Gary has been in the business for over 30 years. He trained in some of London’s best kitchens and has been running his own highly successful restaurants and catering and events company in Melbourne for 15 years. He has authored 3 books, written food magazines and columns, and is about to launch his new series Far Flung with Gary Mehigan. His philosophies encompass a balanced and healthy outlook on life, along with a joy of preparing, sharing and eating great food. Gary is an advocate for local, seasonal, fresh and – most of all – home-cooked food. Kirrily, aka Beer Diva, has spent 15 years working in beer. She has appeared on radio, TV, press and on stage at the Sydney Opera House, talking about everything from the ancient history of beer to beer gastronomy and busting beer myths (and there are plenty of those). She has trained at Ballarat University in Brewing & Malting, and judged at The Australian International Beer Awards and the Great British Beer Festival in London. Her company, Beer Diva, has hosted over 500 corporate and public events and also runs a bar staff training program. She is the Editor of BeerStyle.com.au and also the Vice President of Australia’s Pink Boots Society, supporting women in the beer industry. Having worked for many years in various kitchens around the world, Miguel Maestre is one talented Spaniard who has made Sydney his home. At 27, he was the head chef of ‘Number One’, for the godfather of Australian cuisine Tony Bilson. After meeting Ferran Adria from the best restaurant in the world ‘El Bulli’, he opened the biggest Spanish restaurant in Australia – ‘El Toro Loco’. TV appearances include TEN’s The Living Room, Boys Weekend, and Miguel’s feasts. He is also the author of two best-selling Spanish cookbooks. Founder of Bruny Island Cheese Co., Nick will be co-presenting the cheese masterclasses. Widely regarded as one of the best cheese makers in Australia, he is also an author, educator, media presenter and cheese judge. He has won many fellowships, awards and grants, including a Churchill Fellowship; is a regular judge at the British, New Zealand and Hobart Cheese Awards; and co-stars in the television show Gourmet Farmer. Nick is passionate about the importance of fostering artisan food and preserving the traditions of food and how it is made. Peter is the National Fine Wine Manager for Dan Murphy’s and has over 22 years’ experience in the wine and hospitality industry. This has included local and international wine show-judging, independent wine retailing, imported wine wholesaling, restaurant wine list design and training, and commercial procurement experience with both hotel groups and airlines. Born in London to parents of Australasian heritage, he became fascinated by the London wine trade after attending secondary school in England; family holidays to great European wine regions further developed this interest. Peter later studied wine marketing and also trained as a chef. Peter leads the Dan Murphy’s Wine Panel and is passionate about sharing his knowledge of wine. Sisters Sammy and Bella are your best friends in the kitchen. The fun and passionate home cooks inspire people to rediscover their family food traditions, be creative in the kitchen with their everyday recipe ideas, and share the joy of food with people they love. As the 2011 My Kitchen Rules winners, the dynamic duo keep busy with their catering businesses Sammy’s Burger Bar and Bella’s Feast. Sarah is a New York Times best-selling author and blogger whose journalism career has spanned 20 years, across television, radio, magazines, newspapers and online. She’s the former editor of Cosmopolitan magazine and was the host of the first series of MasterChef Australia, the highest rating show in Australian TV history. Sarah is the author of the best-selling series of cookbooks from I Quit Sugar.com.